Shooting Sportsman launched in December, 1987. It was the brainchild of Steve Smith, David Wonderlich and David Thomas, who recognized that there were a number of magazines devoted to hunting and shotgunning but none devoted exclusively to wingshooting. In the first issue’s “Welcome,” it was stressed that “. . . we are a working magazine . . . made to be used . . . . We take you to where the birds are, show you how to shoot better, and wrap it all around that nice talk about the guns and the loads and the places . . . . Since then we have tried to hold to that path—focusing on the joys of the hunt and the guns rather than the number of shells fired and birds bagged. The magazine has evolved with time, through changes in ownership, editors and format. In 1993 SSM was purchased by Down East Enterprise, Inc., in Rockport, Maine. 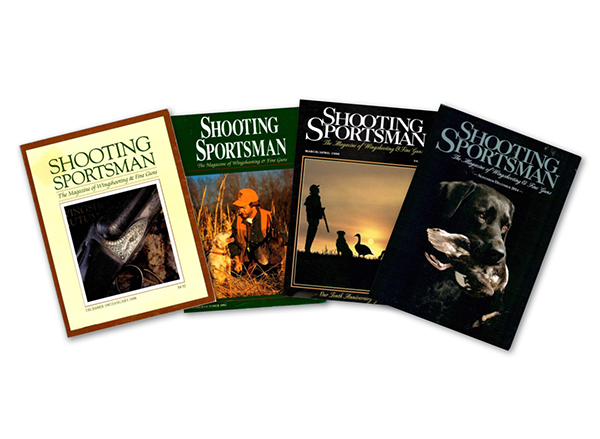 The following year Down East acquired Game & Gun Magazine and folded it into Shooting Sportsman. Today—after more than a quarter-century—SSM is the largest, most popular magazine in the world dedicated to wingshooting & fine guns. It is a celebration of all that is good about the sporting life—from the birds, guns and dogs to the destinations around the corner and around the globe. With an emphasis on beautiful photography and clean design, it features articles by the foremost authorities on wingshooting, shotguns, hunting dogs and more. And with its excellent production quality, it is a publication made to be enjoyed and collected. Down East Enterprise, Inc., is a multimedia company that currently publishes Down East: The Magazine of Maine, the largest paid-circulation magazine dedicated to the Pine Tree State and Shooting Sportsman magazine.